Yet another strike has broken out at a south China factory supplying parts for Japan's Honda Motor Co., the latest in a string of stoppages by Chinese workers demanding a bigger piece of the country's economic wealth. This article also includes a round-up of recent strikes in China. The strike, at Atsumitec Co. in the city of Foshan, began on Monday, with about 90 of the plant's 200 workers stopping work to demand a nearly 60 percent pay increase, said a worker who declined to be identified. On Wednesday, nearly all of the remaining Chinese employees joined the stoppage in response to a threat from factory management to fire the strikers, the worker added. "The Japanese managers just threatened and humiliated us Chinese," he said. A Honda spokeswoman in Tokyo said the factory supplied gear sticks to the car maker's local plants, and said the workers had been on strike since July 12. The new strike marks the end of a couple of weeks of relative calm for foreign-run Chinese factories. Stoppages by workers demanding pay increases had disrupted operations for several weeks in May and June. "I'm not surprised to see another strike breaking out," said Geoffrey Crothall of the China Labour Bulletin. "The increases in minimum wage announced in several places in China this month might be enough to take the edge off of worker discontent, but it's not enough. The basic problems of low pay, long working hours and the lack of effective communication between workers and management are still there." The strikers are demanding Atsumitec increase their monthly wages to 1,540 yuan (about $227) from 900 yuan (about $130), the worker said. "We are taking into consideration the average salaries in Foshan and at other autoparts factories in the area," he said, adding that the 1,540 yuan per month was less than the wages paid at some of the other plants. The factory supplies parts to Dongfeng Honda, a tie-up with Dongfeng Motor Group Co and Guangqi Honda, Honda's joint venture with Guangzhou Automobile. The plant has enough inventory to last through Friday, meaning that the car assembly plants would run out of parts if the strike continued through the weekend, the worker said. The labor action follows a turbulent period in June, which saw hundreds of workers at foreign-owned factories, many in the affluent Pearl River Delta, walk out to demand better pay. The strikes highlight how just-in-time manufacturing, now highly popular among western manufacturers, can put companies at risk because it allows little margin for error when supply chains get disrupted. The work stoppages are a symptom of a broader trend that many investors will have to consider: a Chinese workforce becoming more assertive and selective, and sometimes inclined to protest by strikes, slow-downs and, most often, quitting. "The chance of more strikes increases the more successful the previous strikes are. There's been more and more communication between workers and advocacy groups," said Duncan Innes-Ker, Beijing-based China analyst for the Economist Intelligence Unit. "The workers have networks to exchange information even when there has been a state media blackout. The example set in one place tends to encourage others." The wave of current unrest hit a peak in June, but reports tapered off at the end of the month. The last reported stoppage, at Japanese-owned Tianjin Mitsumi Electric Co, ended on July 3. China's domestic media have been largely mute about the strikes, apparently due to state censorship. But Xinhua has issued reports about the unrest on its English-language service. Labour costs in China have been rising, partly encouraged by a government that wants to turn farmers and workers into more confident consumers, even as it tries to keep a lid on strikes. Earlier strikes disrupted production at auto makers Toyota and Honda, and have laid bare the rising demands of China's 150 million migrant workers, especially younger ones wanting to secure a foothold in urban areas. Honda Motor Co (7267.T) said workers at a Chinese factory of Atsumitec Co have been on strike since July 12, with no resolution reached as of Thursday. The factory in Foshan, Guangdong province, supplies Honda's local plants with shift levers. Japan's No.2 automaker said its four car plants in China were operating as usual with inventory. Honda's export-only factory in the southern Chinese city of Guangzhou resumed normal operations on Friday after the company reached a compromise with workers. Production at the plant was partially halted on Wednesday and Thursday after a few dozen of the plant's 1,000 employees, seeking higher wages and improved working conditions, refused to return to work. A Honda spokesman declined to disclose the terms of the compromise. Workers at a factory owned by electronic components maker Mitsumi Electric (6767.T), in the northern port city of Tianjin, entered their third day of strikes on July 1. There are 3,000 employees at the plant. One told the official Xinhua agency he earned only 1,500 yuan ($220) a month after working regular overtime and Saturdays. Industrial conglomerate Ingersoll-Rand Plc (IR.N) said a three-day work stoppage involving workers at a Zhongshan factory in southern China had ended. The plant, which makes commercial air conditioning systems for Trane -- an air-conditioning systems maker that Ingersoll-Rand acquired in 2008 -- returned to production as of Saturday, June 26, the firm said. Striking workers at a Denso (Guangzhou Nansha) Co Ltd factory said they had reached agreement with management on June 25 after Denso promised a pay rise of 800-900 yuan per month. Workers had returned to full production earlier on expectations they would reach an agreement. The factory, owned by Japan's Denso Corp (6902.T), supplies fuel injection equipment and other parts to Toyota, Honda and other car makers. It stopped shipping to customers on June 21. - Toyota Motor Corp (7203.T) said on June 25 it planned to resume production at its 360,000 units-a-year joint venture car plant in Guangzhou on Monday, expecting supply to flow again from the Denso factory. The GAC Toyota Motor factory had been suspended since June 22. A one-day strike at NHK-UNI Spring (Guangzhou) Co Ltd ended late on June 23. The plant, 60 percent-owned by Japan's NHK Spring and 40 percent by a Taiwanese firm, makes suspension springs and stabilisers for nearby assembly plants of Honda Motor Co Ltd, Toyota and Nissan Motor Co (7201.T). 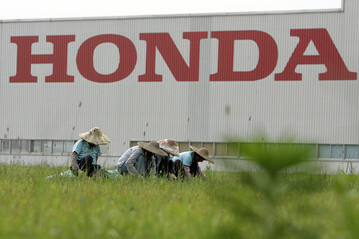 Honda said production at south China car plants, suspended due to the strike, restarted on June 24. Media had reported a Nissan factory in Guangzhou halted production briefly on Wednesday because of the walkout. Toyota's Tianjin factory, held jointly with Chinese carmaker FAW, resumed output on June 21 after the strike-hit Toyota-affiliated parts maker Toyoda Gosei Co said it reached an agreement with workers. Toyoda Gosei said workers agreed to extra allowances for working in the summer heat and for a perfect attendance record, on top of an original 20 percent wage increase. Honda affiliate Nihon Plast (7291.T) said on June 21 it settled a labour dispute with workers at its Zhongshan plant, which produces plastic parts including steering wheels. The plant resumed production late on June 18 after a strike the previous day. Denmark's Carlsberg (CARLb.CO) said a strike at a brewery it part-owned in the southwestern city of Chongqing ended when workers returned to work on Friday (June 18). Honda saw an unusually long 3-week stoppage at its wholly owned parts factory in Foshan when 1,900 workers downed tools demanding better pay. After violent clashes and a management move to hike pay by 24 percent, most returned to work on June 4. Some 1,500 workers at Honda parts supplier Honda Lock, walked off the job on June 9, demanding a 700 yuan rise in basic wages and the establishment of an independent trade union among other conditions. Workers rejected an initial offer, but agreed to return to work on June 15 in anticipation of an improved deal. In the end, however, management refused to grant more than a 280 yuan rise in wages and benefits, which was grudgingly accepted by most.